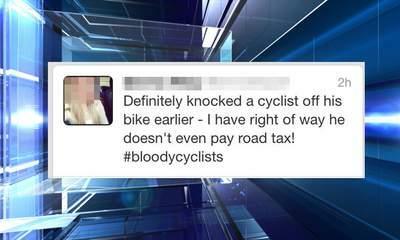 A motorist who tweeted about '#Bloodycyclists' after knocking a rider off his bike says the Twitter boast was 'the biggest mistake of my life'. Emma Way posted the online message after knocking cyclist Toby Hockley off his bike on Sunday, raging that the biker 'doesn't even pay road tax'. After Toby, 29, was flung into a hedge having been struck by a car, Emma's Twitter outburst went viral. Her message read: 'Definitely knocked a cyclist off his bike earlier. I have right of way - he doesn't even pay road tax! #Bloodycyclists'. It was retweeted several hundred times and led to what a tearful Miss Way described as the public 'judging me on one man's side of the story'. The trainee accountant, 21, who disputes Mr Hockley's version of events- told how the stupid comments were said on 'spur of the moment'. Miss Way said: 'If I have known it would get this far I would never have sent the tweet to be honest. 'If I could take the tweet back I would but I can't. There is definitely a lesson to be learnt here but everyone knows what social media is like. Miss Way now faces potential charges of failing to stop at the scene of the accident, driving with due care and attention and failing to report an accident to the police. She has also been suspended by her employers. She added: 'I do not have a negative attitude towards cyclists, I cycle myself. The tweet was just a tweet. Mr Hockley initially planned to keep the incident to himself but then changed his mind and called officers after he spotted a tweet from the driver. 'I think she came across as a very silly girl and made herself look like a bit of a fool. He forwarded the message to police who are now investigating the matter. He added: 'She hit me hard, really hard. I am lucky to be alive. But I managed to get out of the hedge and stand up. The freelance chef said he felt battered and bruised but was able to finish the course after a few roadside fixes to his bike. 'I burst out laughing, I couldn't believe how lucky I was and that I was still in one piece,' he said. 'I had a hug with my co-rider at the side of the road and was just full of adrenaline. Miss Way, also from Norwich, has now removed the Twitter account and Norfolk Police said it had spoken to both parties. It is shocking to see where British politics is heading when demagogues like Nigel Farage take such a lead in opinion polls for the European elections. In my view, it was a shame the EU granted the UK the Brexit extension that has allowed people such as Farage to emerge from obscurity once more. There could have been no real major impact — everyone would be happy and power would again swing between Conservatives and Labour, like a pendulum. Rachel Johnson, sister of Boris, today revealed she is standing as a European election candidate — and took a swipe at her Brexiteer brother. Talking exclusively to the Evening Standard, the campaigning journalist said she will stand in the South West region for Change UK, the pro-Remain party set up by The Independent Group of MPs. Ms Johnson said she did not want to see Brexit “rubbing out my children’s prospects and chances of living and travelling and working in Europe”. The 29-year-old journalist was shot last Thursday night while observing rioting in Londonderry. Death, and plenty of it, is inevitable in the final battle against the Night King and the White Walkers. In the official trailer, we saw Arya Stark running through the crypts of Winterfell, seemingly terrified. In the second episode, which aired on Monday, there was much talk about the crypts of Winterfell. Who will be chosen as the godparents of Harry and Meghan's baby? Royal family members traditionally have a larger than average set of godparents. For example, Prince Louis has six godparents, Princess Charlotte has five, and Prince George has seven. An iconic photograph of New Zealand Prime Minister Jacinda Ardern embracing a Muslim woman after the Christchurch terror attacks is to become a mural on a 75-foot Australian silo. Ms Ardern was praised for her strong and empathetic response to the massacre at two mosques that killed 50 people last month. A photo taken by Hagen Hopkins of her visiting victims of the attacks resonated around the world and was projected onto the world’s tallest building, Burj Khalifa in Dubai. The so-called New IRA has admitted responsibility for the murder of journalist Lyra McKee in Londonderry. Ms McKee, 29, was shot in the head as she covered rioting on the Creggan estate in Derry on Thursday night and died later in hospital. In a statement given to The Irish News using a recognised code word, the self-styled New IRA said: "On Thursday night following an incursion on the Creggan by heavily armed British crown forces which provoked rioting, the IRA deployed our volunteers to engage. A third of people living in England think Scottish bank notes are "fake", according to a new survey. Photos of notes from the Bank of Scotland, Royal Bank of Scotland and Clydesdale Bank were shown to 1,710 people. Another 23 per cent told Censuswide Scotland, who conducted the market research survey, they would not accept the notes, and 16 per cent believed them to be out of circulation. A man has been arrested in connection with the death of Trainspotting 2 actor Bradley Welsh who was shot dead outside his Edinburgh home. Police Scotland said the suspect had been released pending further inquiries. Welsh starred alongside Ewan McGregor, Ewen Bremner, Jonny Lee Miller, and Robert Carlyle in T2 Trainspotting, playing gangland figure Mr Doyle. Luxembourg's Grand Duke Jean, who oversaw the transformation of the Grand Duchy into an international financial centre before abdicating and handing over to his son, has died at the age of 98. Jean returned to Europe in 1942 to receive military training at Sandhurst in Britain. After the war, Jean married Belgian princess Josephine Charlotte and had five children. Greenhouse gases, which have been frozen below the soil for centuries, have already begun to escape. Photograph: John Mcconnico/APThe release of methane and carbon dioxide from thawing permafrost will accelerate global warming and add up to $70tn (£54tn) to the world’s climate bill, according to the most advanced study yet of the economic consequences of a melting Arctic.If countries fail to improve on their Paris agreement commitments, this feedback mechanism, combined with a loss of heat-deflecting white ice, will cause a near 5% amplification of global warming and its associated costs, says the paper, which was published on Tuesday in Nature Communications.The authors say their study is the first to calculate the economic impact of permafrost melt and reduced albedo – a measure of how much light that hits a surface is reflected without being absorbed – based on the most advanced computer models of what is likely to happen in the Arctic as temperatures rise. It shows how destabilised natural systems will worsen the problem caused by man-made emissions, making it more difficult and expensive to solve.They assessed known stocks of frozen organic matter in the ground up to 3 metres deep at multiple points across the Arctic. These were run through the world’s most advanced simulation software in the US and at the UK Met Office to predict how much gas will be released at different levels of warming. Even with supercomputers, the number crunching took weeks because the vast geography and complex climate interactions of the Arctic throw up multiple variables. The researchers then applied previous economic impact models to assess the likely costs.Permafrost melt is the main concern. Greenhouse gases – which are released when organic matter that had been frozen below the soil for centuries thaws and rots - have already begun to escape at the current level of 1 degrees Celsius of global heating. So far the impact is small. Ten gigatonnes of carbon have been released from the permafrost but this source of emissions will grow rapidly once temperatures rise beyond 1.5C.On the current trajectory of at least 3C of warming by the end of the century, melting permafrost is expected to discharge up to 280 gigatonnes of carbon dioxide and 3 gigatonnes of methane, which has a climate effect that is 10 to 20 times stronger than CO2.This would increase the global climate-driven impacts by by $70tn between now and 2300. This is 10 times higher than the projected benefits from a melting Arctic, such as easier navigation for ships and access to minerals, says the paper.It would also add to global inequality because most of the economic burden – equivalent to almost the entire world’s current annual GDP – is likely to be borne by countries in warmer poorer regions such as India and Africa, which are most vulnerable to a rise in temperatures.“It’s disheartening that we have this in front of us,” said Dmitry Yumashev of Lancaster University. “Even at 1.5C to 2C, there are impacts and costs due to thawing permafrost. But they are considerably lower for these scenarios compared to business as usual. We have the technology and policy instruments to limit the warming but we are not moving fast enough.”The new projections contained a modicum of good news because the impact of land permafrost melt was at the lower range of what had been feared. Previous estimates suggested these Arctic tipping points could add more than 10% to climate costs. Some feared the methane alone could prove catastrophic but the new figures show CO2 remains the greatest concern.“We still have a time bomb, but it may not be as large as previously believed,” said Yumashev. But he warned against complacency because even at the low end the damages are huge, the study has a considerable degree of uncertainty and the costs of several other potential tipping points have yet to be calculated. Residents in Brixham, Devon, say a developer cleared a forest before securing planning permission. Saudi sisters Maha and Wafa, awaiting help in Georgia, say they fled the kingdom because life had become unbearable because of torture.The Saudi Al-Subaie sisters, Maha and Wafa, remain in Georgia awaiting an offer from a third country to take them in as asylum seekers.“We decided to leave Saudi Arabia because life there had become unbearable from the torture. We were threatened and abused daily by our family, father and mother and brothers,” says Maha in an interview with RFI.The two sisters, Maha and Wafa, aged 28 and 25 respectively, have been making headlines since 17 April when they began tweeting about their ordeal, initially under the twitter handle @GeorgianSisters which was quickly blocked. Their official handle is now @GeorgiaSisters2 .Escaping the guardianship system of Saudi Arabia, whereby a woman, regardless of her age, is under constant surveillance by an official male guardian, is already a feat of its own.In the past year, with more and more women taking flight from the kingdom, a new app called Absher - available both on Google and Apple - was introduced to help male guardians limit attempts by any woman to leave.The system allows a Saudi man to follow the location of a woman and order government documents such as a passport. It also gives the man power to grant a woman authorisation to leave.According to one interview with the Daily Beast, the girls managed to work around this double barrier. They stole their father’s phone and signed into Absher granting themselves leave from the country and then proceeded with their plan.How they obtained passports has not yet been revealed.Strained family tiesIn a family of four brothers and six sisters, Maha and Wafa are the only girls to leave.“We are very close to each other and we are exposed to the same violations” explains Maha.She was married but divorced seven years ago. She has a nine-year old son from that marriage. But the abuse that both she and her sister suffered at the hands of her family became unbearable, especially in front of her son. “It is worse when my father hits me in front of him,” explains Maha.The divorce was apparently the moment when things started to deteriorate for the sisters. Maha’s ex-husband accused her of having been unfaithful to him. In response, the family took it upon themselves to punish her for causing them shame. When Wafa started to defend her sister, she too was punished.“There were many reasons for their abuse and violence, but mostly it was for not obeying their orders, or to prevent us from making our own decisions about personal matters, or still just to vent their anger because we were like their property and could not defend ourselves,” says Maha.“All my brothers have absolute power from my parents” explains the older sister. “But my eldest brother was the worst”.She adds that they couldn’t complain to the Saudi authorities about the abuse since their brothers work for the security sector and the government would not protect the two girls.According to documents seen by RFI, Saudi Crown Prince Mohammed Bin Salman has promised the Al-Subaie family that the girls will be found and brought back to the Kingdom. Maha confirms that the Al-Subaie tribe is in fact quite powerful. “Our family is big and they can reach the government.” So such a promise by the Saudi authorities serves to send the girls “a threatening message,” she adds.Dreams of a better life“Since 2014, the idea of running away was the only solution,” according to Maha. The fact that she couldn’t even leave the house with her son was already infuriating.But to have him see his own mother being physically abused was too much. “I will not let him see his mother being hit and facing violence.”Her decision to leave was not an easy one because she had to leave her son behind. “This situation kills me. My son will certainly understand my position,” she adds. He is now living with one of his grandparents.When the sisters finally obtained passports, they knew they had to run away quickly before anyone found out. Without time to get a visa, the sisters transited through Turkey and crossed over into Georgia. Holders of a Saudi passport do not need a visa to enter Georgia.The goal was to secure entry to a country which would accept their plea for asylum. In Georgia, they remain unsafe given that anyone from the family can enter and try to take them back to the Kingdom, or worse. “We do not want to be kidnapped or killed,” exclaims Maha.Waiting in limboTheir first embassy stop upon arrival to Georgia was that of France. “France rejected us after a week. After that we made several attempts to get out of Georgia and did not succeed.”When they returned to the French embassy, staff informed them that they had received an email asking for help to search for the young women in the Georgian capital Tbilisi.But that story has added to their determination to find a way out. The French embassy knows that the girl’s lives are in danger. “I do not know why they did not help us”.That’s when the sisters made the decision to go public on social media with their identities. Soon afterwards, they published photos of their unveiled faces.The Georgian government has told the sisters that neither their father nor brothers have entered the country. “But we have a large family.” They have already received many threats from online users, particularly from their cousins and possibly their brothers.Maha and Wafaa have been in contact with the United Nations Refugee agency, the UNHCR. In the meantime, they say they are safe. They are currently awaiting a response from the Canadian embassy. The industry's success directly impacts some 850,000 people. The Easter attacks on churches and hotels in Sri Lanka were highly organised and carried out with devastating efficiency. In addition a car bomb was detonated, and explosives were discovered at a bus station, a banqueting hall and a large house, thought to belong to one of the militants. The Sri Lanka attacks would involve a team of at least 20 or 30, including drivers, couriers, trainers and keepers of safe houses and bases.